The Science Communications course at the Mount Saint Vincent University inspired be to dig deeper into our perception of ICTs – especially as I am working in this field professionally, an examination of my personal mindset seemed to be in place. 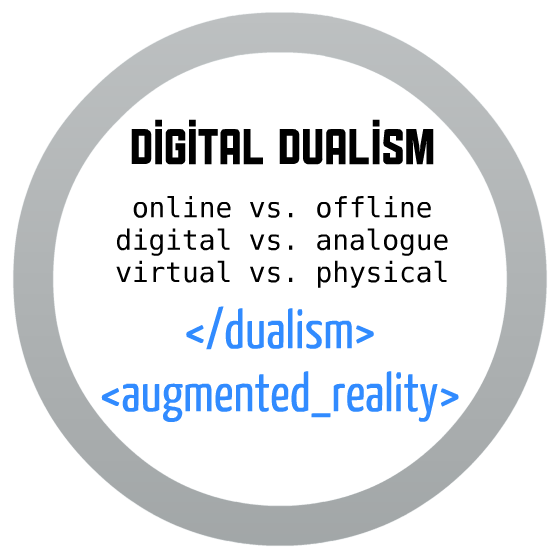 While researching material for my paper on 24/7 Connectivity, I stumbled upon a huge issue in both academic and popular discourse: Digital Dualism. The perception that online is different from offline, that virtual is not physical (and hereby, less “authentic”). I don’t believe in those virtual (sic!) differences, but that we live in an augmented reality – with all its challenges. For the purpose of this paper, I combined the concept of Digital Dualism and the Mean World Syndrome in order to analyse the current discourse on ICTs from an either cyber-utopian or -dystopian point of view. Information and communication technologies (ICT) are a an indispensible factor of today’s reality. The impacts of technology on both individuals and societies are broadly discussed in an academic and popular discourse, but the conversation is strongly influenced by a dualistic mindset and an either cyber-dystopian or cyber-utopian bias. This paper examines the chronology of techno-cultural metaphors and the personification of tech companies through these terminologies, implications of digital dualism and a Manichean worldview on both an academic and a popular perception of ICTs, the bias of traditional media in illustrating social technologies, plus the danger of a nascent Mean World Syndrome 2.0. Both cyber-pessimistic and cyber-optimistic authors are analyzed in their contradistinction, and recent scientific research illustrates the need for a more culturally-sensitive approach to studying the internet. The articulation of an augmented reality rather than a dualistic philosophy are also discussed, as well as personal and professional challenges for the science communication practitioner. Bauerlein, M. (2008). The dumbest generation: How the digital age stupefies young Americans and jeopardizes our future (or, don’t trust anyone under 30). New York, NY: Jeremy P. Tarcher/Penguin. Bryant, J., & Zillmann, D. (1994). Media effects: Advances in theory and research. Hillsdale, N.J.: Erlbaum. Dixon, J. (2012, November 5). Guest lecture: Social media in science communication [PowerPoint slides]. Mount Saint Vincent University, Halifax. Gerbner, G., Gross, L., Morgan, M., & Signorielli, N. (1980). The “mainstreaming” of America: Violence profile No. 11. J Communication Journal of Communication, 30(3), 10–29. Hansen, M. (2000). Embodying technesis: Technology beyond writing. Ann Arbor, Mich.: Univ. of Michigan Press. Morozov, E. (2012a). The net delusion: The dark side of internet freedom. New York: PublicAffairs. Richards, T., & King, B. (2004). An alternative to the fighting frame of news reporting. Peace Research Abstracts, 41(2). Skinner, D., Compton, J. R., & Gasher, M. (2005). Converging media, diverging politics : a political economy of news media in the United States and Canada. Lanham, Md. : Lexington Books.